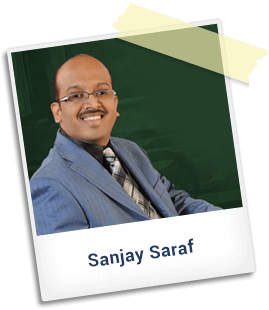 Sanjay Saraf Educational Institute (SSEI) is one of the leading coaching institutes in India providing quality education in the field of finance. With a vision to professionalize, institutionalize and upscale the education delivery process, Sanjay Saraf Sir promoted SSEI in the year 2009.In short span of 7 years, SSEI has created a pan India presence and today is proud to be associated with its 130+ franchisee across the country.Over the years, SSEI has invested significantly in building state of art infrastructure, teaching methodology and quality material to stand apart and stay unrivalled in the world of quality training in finance. Leveraging on the infrastructure and its wide network, SSEI today is offering unparalleled quality services to students through Face‐to‐Face, Deferred Live and Direct‐to‐Home modes of delivery.Through fostering strategic tie‐ups to building in‐house capability, SSEI today has positioned itself at an elevated platform enjoying unparalleled advantage by being the only established player offering quality training services in finance for courses both domestic and international. SSEI traditionally has been providing the best in training for domestic courses like CA, CS and CMA and international courses like CFA, FRM, ACCA and CPA. Over the past one year SSEI has forayed into Actuarial Science and MS Excel and established itself as a dominant force in the field.